The development of these rules has broadened the scope of the original faction - Bokkenrijders to something a little more generic. It is focused on the general 17th century obsession with all things evil. So the Faction is being broadened to encompass the dark side in general. Here is one of the Cultist riders. 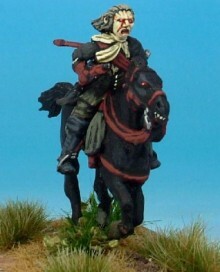 A Warfare Enthusiastic Cavalry trooper with a different arm and a different paint job. Don't miss the close date of January 31st and remember and send you photos!